Special Olympics has helped Warren County Falcon athlete Schuyler Farris blossom into a popular young man at Monmouth-Roseville High School and into a multi-sport medal winner in Special Olympics. But, perhaps most impressively, participation in Special Olympics helped Schuyler overcome a serious injury this summer. Schuyler was assisting his local FFA chapter place American flags around cemeteries in Roseville on July 3 when he suddenly slipped off the hay wagon he was riding in, falling face down onto the pavement as they moved from one cemetery to another. The fall was bad enough, but then the hay wagon rolled directly over his dominant, right arm seriously dislocating it. Schuyler endured six painful attempts to reset the arm manually, before an orthopedic surgeon was called in to repair the joint. Schuyler’s dedication to his team, and desire to compete again with his Special Olympics teammates, helped spur an amazing recovery. “He wanted to play ball,” said his grandmother, Deb Farris (a dedicated Special Olympics supporter, chaperone and new coach in her own right). She went on to explain Schuyler was nervous about not being able to compete, but intensely dedicated to return to action. After three and a half weeks in a cast, Schuyler began working with a physical therapist, repeatedly passing recover milestones ahead of pace. “His therapist really pushed him, but he worked just as hard,” Deb said. 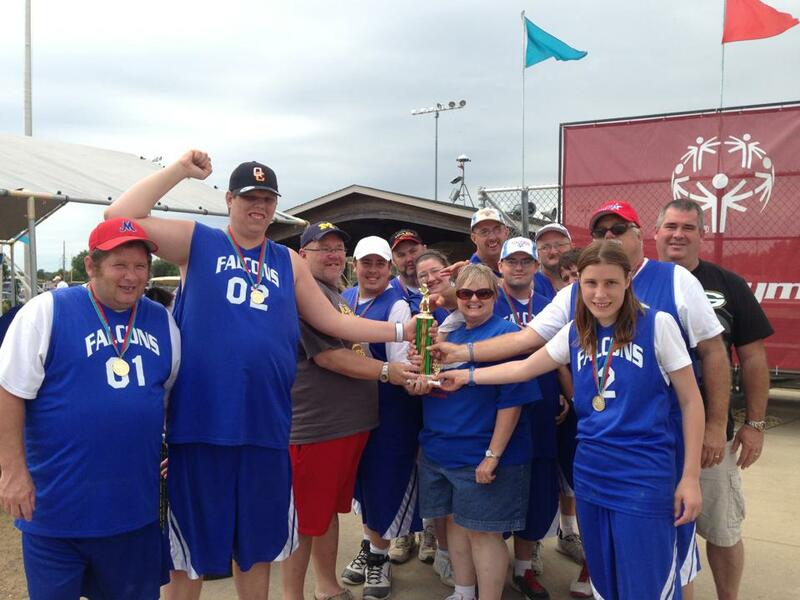 Meanwhile, his softball team went on a roll, qualifying to compete for a gold medal at the 2013 Fall Games. While recovering, Schuyler served as an honorary coach, but that wasn’t enough. Schuyler was chomping at the bit to get back into action. With his therapist’s approval, Farris returned to the practice diamond in September, just a few weeks after the accident. “He was so excited for it,” Deb said of his return to practice. Schuyler had more excitement just around the bend. Schuyler clinched the state title for the Falcons, securing the final out in the championship game by spearing a hard-hit line drive. It was a hit that would have been praised in most men’s leagues around the state, a screaming liner that was destined to go all the way to the fence to be sure, but Schuyler “playing his shortstop position“ confidently made the play to an appreciate round of applause. Schuyler hasn’t just succeeded on the playing field. Special Olympics has helped him become a more open, gregarious individual who has been honored by the community as a whole. He even met his girlfriend, Tamara Parks, another active athlete, through Special Olympics. Deb said they like to hold hands, but when it is time to compete it is all business. “It is the neatest thing, the way they focus on their events,” Deb said. Participation has helped Schuyler grow. “He has blossomed so much,” Deb said, noting he started just with track but is now a year-round athlete. “He is more outgoing and loves to talk a lot (to members of the community).” His classmates even nominated him to the school’s prom court. 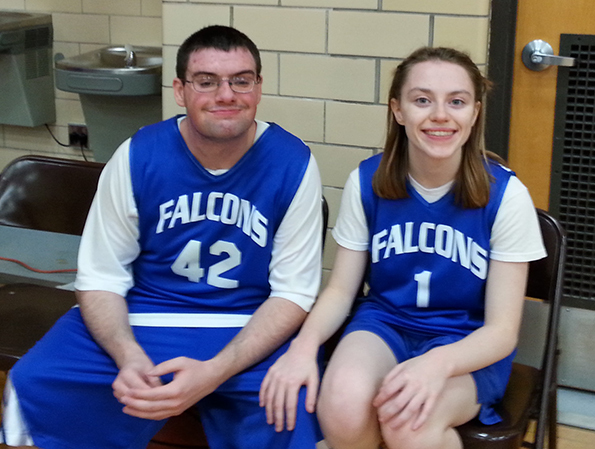 In addition to track, Schuyler competes in softball, bowling, basketball, volleyball and snowshoeing. 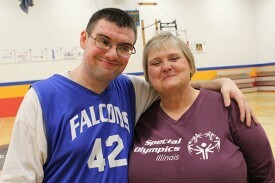 Deb said the mentoring Schuyler has received from more veteran Special Olympics athletes in Warren County has also been a key to his success. Perhaps even more telling of the admiration Schuyler receives from the school staff, Monmouth-Roseville’s Athletic Director, Chuck Grant, nominated Schuyler for his school’s Athlete of the Week with local radio station 1330 WRAM during basketball season last year.